Private sector credit continues to contract and is again accelerating in the annual rate of decline (-10.4% yoy in May as compared to -9.3% declines in April and March). Mortgage credit contractions are steadily declining (-1.8% in May against -1.6% in April & 1.4% in March). 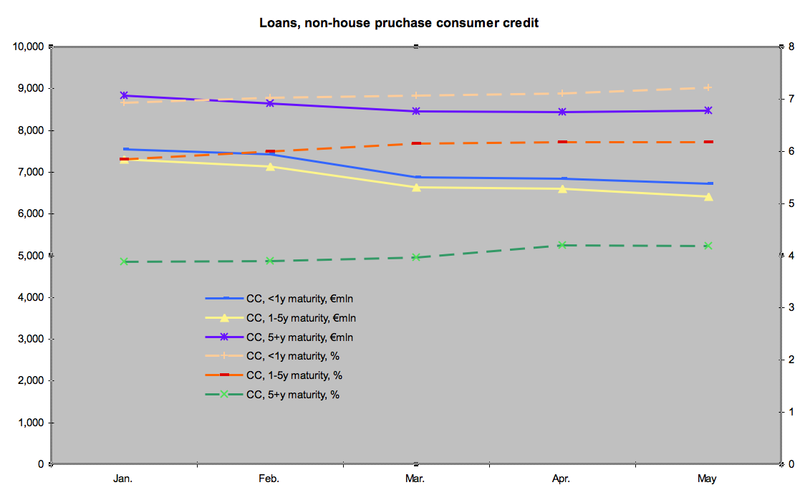 Nama - now through 50% of the loans purchases - has had no positive impact on credit supply. If anything, as charts for households lending show blow, it is being accompanied by a dramatic increase in the cost of borrowing for ordinary families. 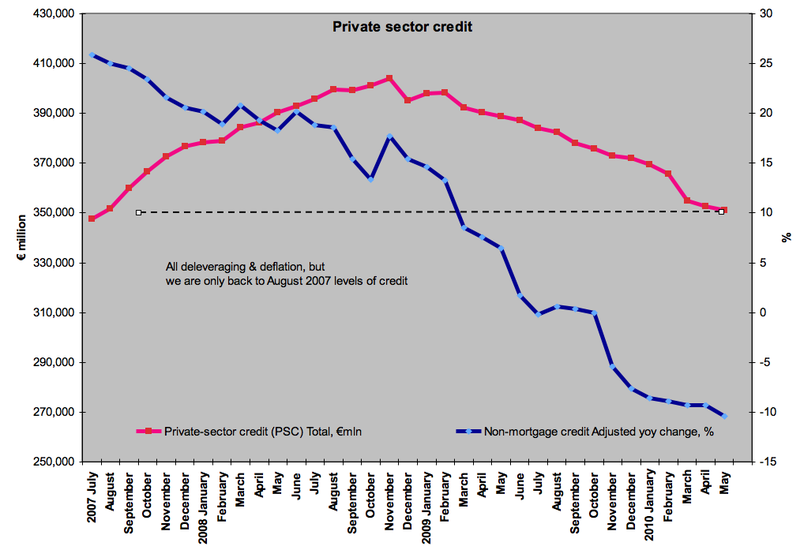 Aggregate private sector credit above. Disastrous trends of the last 2 year continue unabated, despite the already significant contraction in the credit supply. This suggests that we are in a continued downward spiral when it comes to business and household investment (future capacity is under continued pressure down and the only thing that provides some positive support to capital side is, most likely, MNCs own inter-company investments). 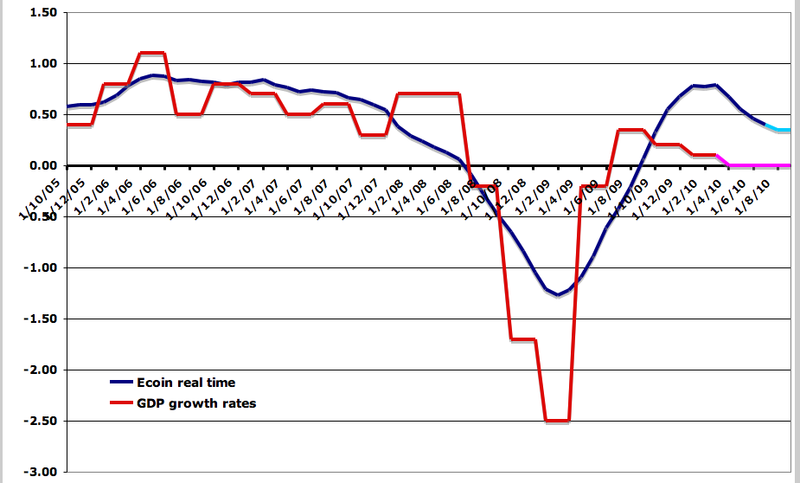 This goes to explain why one cannot accept earlier DofF projections for 2013-2015 potential rates of growth. We are in a situation very similar to Japan in the mid-1990s, where existent production is being driven at the expense of capital stock. 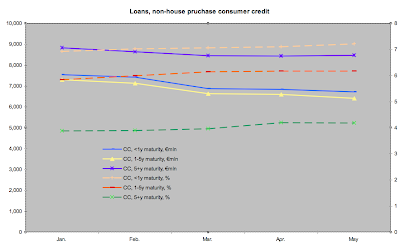 The reason for the different dynamics is that it is easier for households to cut back on smaller credit demand than on massive mortgages burden. 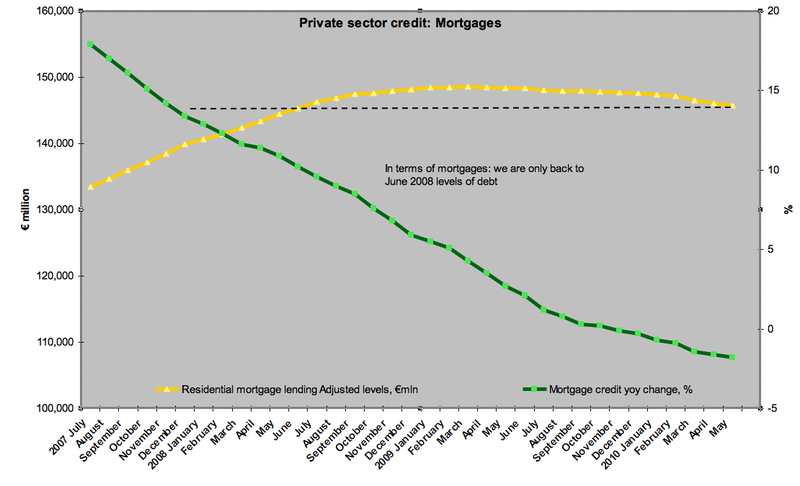 Hence, non-mortgages lending is a leading indicator for what we can expect to follow in the mortgages markets. Not exactly a bright future for the housing markets, then. 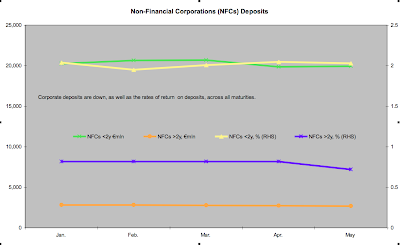 Notice that deposits are down, mom, across the board, except for shorter term maturity corporate deposits. 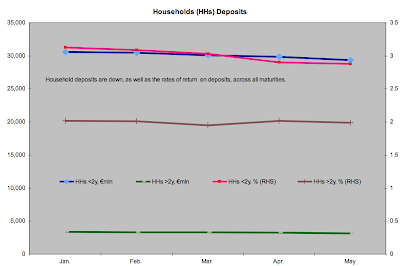 But yoy all deposits are down. 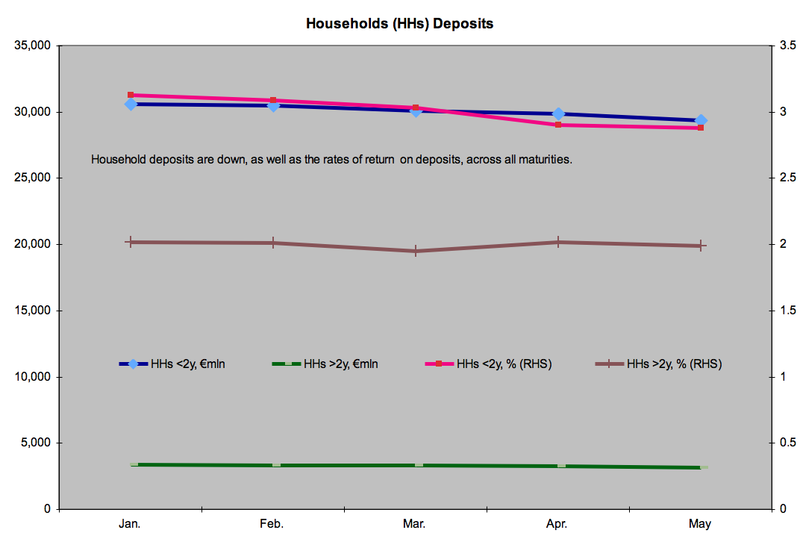 Combined decline in all deposits in volume since January 2010 is €1,869 mln, or 3.4%. Not a small change. All deposit rates are down year on year - we are being paid less to save, but are charged more to borrow. Once Nama starts transfers, incentives for the banks to play a Good Fella will diminish - repossessions will remain low, but rates will rise. We now can see this happening around us. 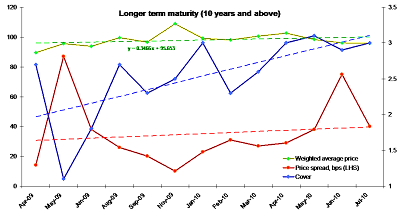 Once Nama completes transfers, banks will go in earnest at rebuilding their margins & capital, meaning - repossessions will accelerate dramatically and rates will rise to the levels where the burden of financing mortgages will become a driver for more repossessions. 3-6 months after the above stage, banks will start hoarding repossessed property on their books. They will be forced to start selling it ca 6-9 months after February 2011 (completion date for Nama purchases). Combined effect of massively more expensive mortgages credit and inflow of repossessed properties into the market will drive prices in housing markets even further down. So far, we are through the 1st bullet point and getting closer to the second one. Meanwhile, in the land of short term loans, rates are more steady and credit supply is falling gently. Now, let me ask you this question. What should be the priority here? Making sure people are not being skinned to pay for their homes, or making sure that credit cards rates and car loans are being underpinned by more stable interest rates? 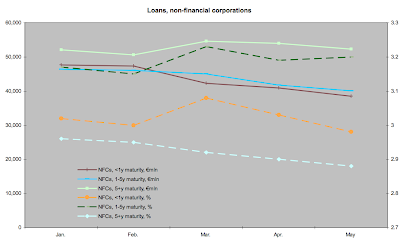 Credit to non-financial corporations is continuing to slide. Year on year, shorter term (working capital) credit is now off a massive 19.3%. Longer term credit is off 2.7% yoy. What does this tell me about the economy? Companies have no capacity to refinance shorter term credit obligations, resulting in a cash flow pressures and lack of operating capital. Not exactly a success story for our financial system administrators and regulators, then. 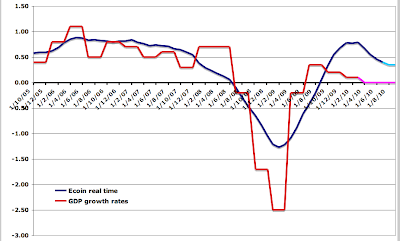 GDP forecast range is for quarterly growth of -0.1% to +0.05% in Q3 2009. 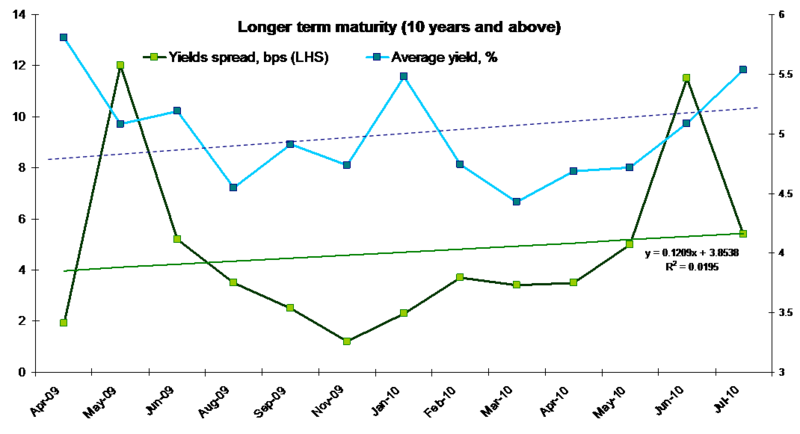 PTSB/ESRI house price index is in for Q2 2010. The core result: house prices were down, again, by 1.7% qoq in Q2 2010 - a lower rate of change on Q1 2010 contraction of 4.8% qoq. Thus, prices are now off-peak by 35% to an average of €201,364. Dublin prices are down 3.5% qoq in Q2 2010 and are off 44% relative to peak. This gap between nation average and Dublin, assuming (as seems to be reasonable) that capital prices appreciation prior to the current crisis were significantly affected by underlying demand, should be erased over the next 12 months plus. Which means we can expect at some point that Dublin will lead the recovery across the country, while other regions continue to contract toward the 45-50% nationwide average off-peak pricing. You can see where these valuations are heading, don't you? Take a full range of estimates mid-range point of €177,000 - that would be a decline of 43% off the peak prices. Take the simple average price of all mid-range points to get 46% decline. 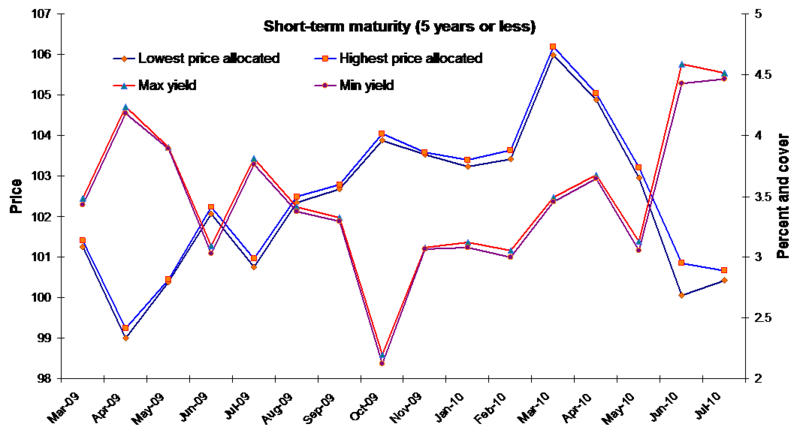 Now, recall - these are equilibrium prices. 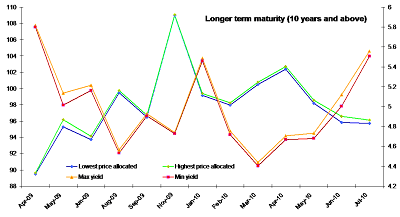 In normal price adjustments, there is a relatively pronounced undershooting in prices - in other words, we can expect prices to fall below equilibrium levels before reverting toward longer term values over time. The depth of this undershooting and its duration depend on some external factors, such as the ease of getting mortgages approvals, mortgage conditions etc - none of which are currently helping the housing markets. So there is a very strong possibility for prices to hit the floor at around -55-60% off the peak. Lastly, there is a question to be asked as to the validity of PTSB's data - the country largest mortgages holder might no longer be the country largest mortgages issuer. And the sample size globally has shrunk substantially. In other words, if a desperate homeowner in the distant province sells a house for, say, €120,000 while a dozen of his neighbors are not braving the market, does this really tell us anything about the market clearing price? Not really. Imagine what the said homeowner would have got for his dwelling if 12 more identical dwellings in the neighborhood had a 'For Sale' sign. Economics 27/7/10: Stress tests of Irish banks? Get real! An excellent comment on AIB and BofI 'stress tests' results from Peter Mathews, worth a direct post (rather than 'just' a comment) on this blog. Read it here. Economics 26/7/10: Old Capital Investment 'news'? Updated: per some detailed feedback from the DofF, see updated text below. 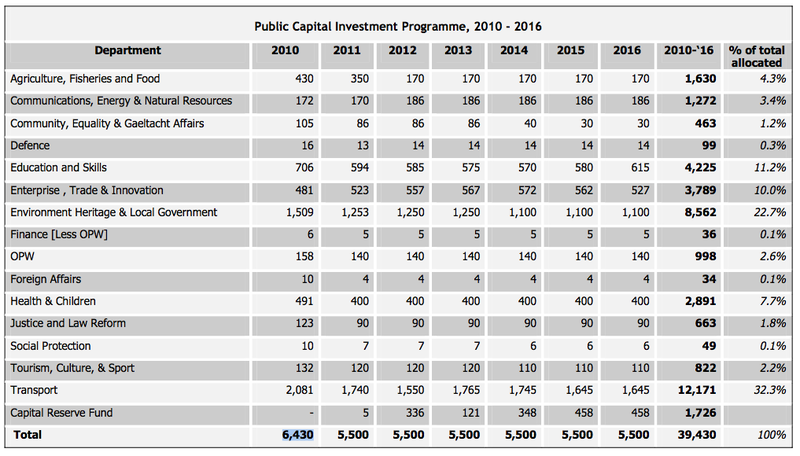 The latest announcement of the extended capital investment programme for 2010-2016 is sounding like a PR exercise. Majority of the projects announced in the programme are the left-overs from the previous National Development Plan. 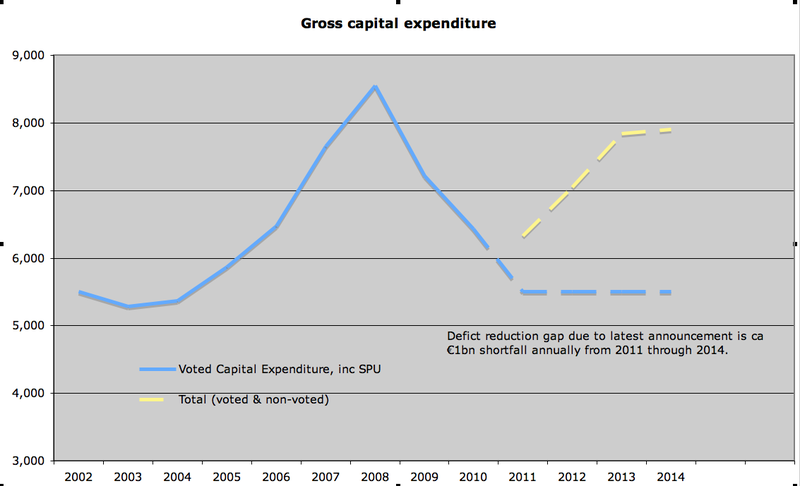 So there is no real news on spending volumes / stimulus extent in the Taoiseach's announcement. This does not imply that the programme is without a merit, but it does imply that the media circus about 'major new investment programme' announcement is seriously overdone. There are, however, some details worth covering. First, the level of 'new' investment. At €39 billion over 7 years it is hardly a 'significant' increase on the historic levels. Taken as an average of 2008-2010 gross voted capital spending, the six year plan that would have stuck to the average would imply a capital spending of over €51.8bn through 2016. Well in excess of Mr Cowen's latest 'Great 7-year Leap Forward'. DofF latest projections submitted to the EU in SPU2010, prepared in December 2009, show expected capital investment of €5,500 per annum in 2011-2014, which, is now exactly matched by today's 'new' announcement. Chart below illustrates, drawing on data from Department of Finance own projections delivered for the Budget 2010. The news component of the announcement is in the detailed breakdown of the numbers by department and within departments - by the specific lines and projects. This is a significant improvement on the SPU 2010, where the same €5,500 million in annual investments was just a number. And then there are cuts in some of the really less economically feasible (or I would say 'White elephant') investments envisioned in the original NDP. 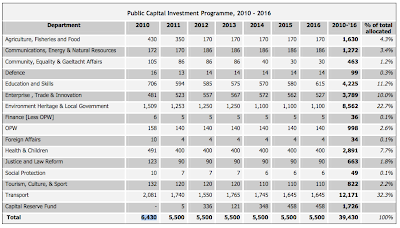 Second, Department of Finance SPU submission to the EU has built in (Table 9: Additional Annual Measures to be delivered in 2011 and 2012) as "Capital already identified and incorporated into the base" the following cuts to capital investment: 2011=1bn, 2012=2bn. If Taoiseach's announcement relates to the new investment on top of the planned NPRF contributions, then the future (2013-2014) savings will have to come out of some other lines of Exchequer balance sheet. Croke Park deal effectively closed the doors on generating new savings from the non-welfare lines of current spending. This means that our Taoiseach, in making today's announcement will be aiming for clawing at least €3bn in new taxes on top of the at least €2bn already planned in Budget 2010 for the years 2011-2012. Now, recall that the same SPU - which is now replicated in the 7-year plan for capital investment - had its validity questioned by the IMF as being too optimistic on the assumptions, imprecise on planned savings and at a risk of failing due to the possible Government fatigue to cuts. Are we now seeing the very things that IMF was warning us about unfolding in front of our eyes. The IMF also said that it is likely that the additional (not planned in SPU) adjustments to fiscal balance will require savings and/or tax increases of ca 2.3% of 2014 GDP, or roughly speaking €5bn. So in the nutshell - either we will be borrowing more to finance that which we already announced years ago, or we will be taxed to death to pay for it. Or both. Oh, and on a funny note - the Irish Times (here) reported that Government is hoping that the new 'investment' will create some 270,000 new jobs, directly and indirectly. My original comment was: so we spend ca €6,500 mln to generate 270,000 new jobs? At this rate of 'expected' jobs creation, we should have some 6.5 million workers in Ireland, using 2009 GDP levels. Was someone in the Government buildings smoking something funny coming up with these numbers? A person close to the report came back to me with their explanation of the numbers. The figures quoted on the aggregate are multi-annual 6-year forward projections that incorporate previously announced jobs targets from IDA and EI. So the direct jobs creation (remember - indirect jobs creation is highly uncertain, while IDA and EI targets are not subject to the announced investment measures) is around 1/2 that number. Now, at 130-140,000 per 7 years and at €39bn total would be in the region of €280-300,000 per job in one-off gross investment. Suppose we spend €5,500 million in year 2011 building stuff. This means we hire builders etc. Suppose we manage to get them at a pittance of €100,000 per job (a very low number). We just increased employment by 55,000. Suppose in 2012 we spend €5,500 again on building some more stuff, plus spend more funds on running the stuff just completed in 2011 (remember, we cannot use €5,500mln allocation in 2012 to operate the stuff just built in 2011, as it would be a current expenditure item). So we have to hire new and re-hire old, but the same number of 55,000 workers. Between 2 years, new jobs creation is 55,000. Not 110,000. And this is what worries me here. Despite the explanations I got from DofF, the document numbers on the jobs front still do not add up to me. Worse than that. Some of the programmes envisioned in the plan will require people to run/operate them in the future, post-construction, and will also require considerable spending of funds on amortization and depreciation, maintenance and operations. Are there any estimates as to what will be the budgetary impact of these 'new investments' on the current expenditure in the future? Let me explain here. Suppose I spend €2mln building a school building. Unless I get the existent staff to run the building, I will have to hire new teachers, new service providers, and I will have running and operating costs. For a school, suppose I will need 2 teachers and 1 service personnel (split into part-time admin and part-time maintenance staff). That's ca €150K annually in wages, plus mark ups for pensions etc - roughly speaking €280-300K per annum. Utilities etc, plus scheduled maintenance, say another €50K. So my initial investment of €1mln creates a continuous liability of up to €350K. Of course, I can cut my construction workforce hired in 2011 and divert 'investment' to funding staff operating my new facility. But that makes it a current expenditure. And it means that the rate of jobs creation will be crowded out over time by the newly added infrastructure demands. Note, these are illustrative figures, but they add up. In 2013: projects from 2011 come on-line, yielding another €950mln, adding to 2012 to generate a permanent increase in gross current spending of €2,050mln. These are crude illustrations, but you get my concerns? Yep - these current costs will have to be paid by us, the taxpayers. And it scares me. And yes, I still do not believe that 270,000 figure. In fairness to the DofF - they have been stressing since yesterday that the figure is there just because they needed some anchor to the economic impact. It is neither rigorous, nor definitive. Lastly, I would like to thank DofF for engaging in the debate and providing some very fair clarifications and explanations of their position on the paper. So the markets are not that enthused about the stress tests. After the initial bounce on the back of 'pass' grades, there are rising concerns about some 19 banks, including AIB, which were given 'all clear' with some serious stretch of assumptions. The quality of the collateral (with sovereign bonds being top tier quality, deterioration in sovereign debt ratings is hitting interbank markets hard). 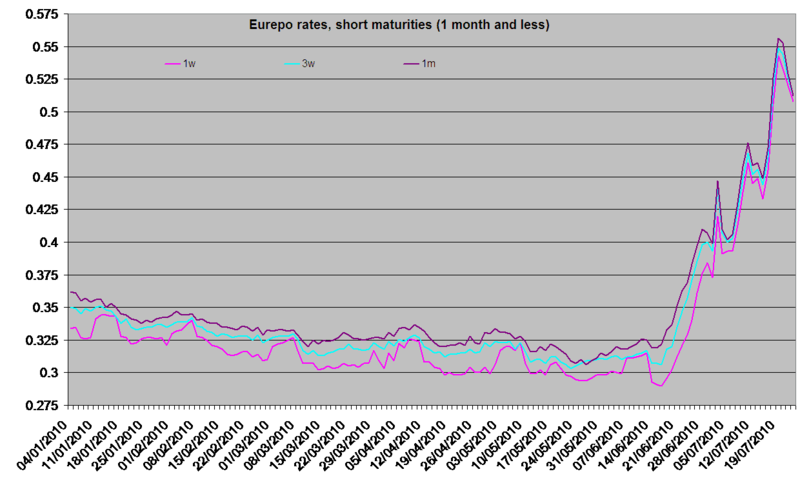 Chart 1 Long maturities have been signalling extremely adverse effect of the Euro rescue package since its inception. 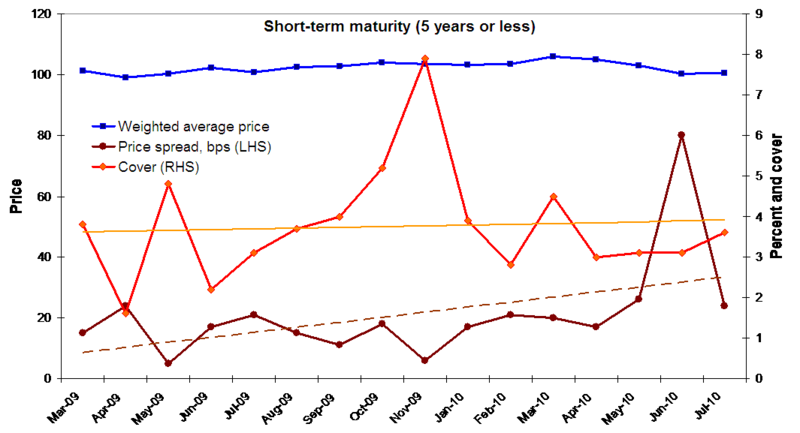 Medium-term maturities show severe deterioration since the euro rescue package. 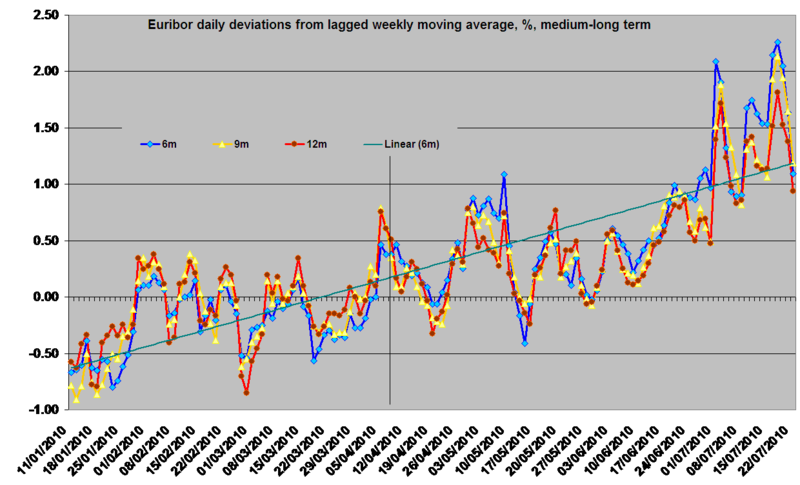 Steepest, and uninterrupted rise in 3 months euribor signals that the rescue package is faltering in delivering anything more than a buy-time for the euro… In other words, we have an expensive (€750 billion-sized) buy-in of short time. 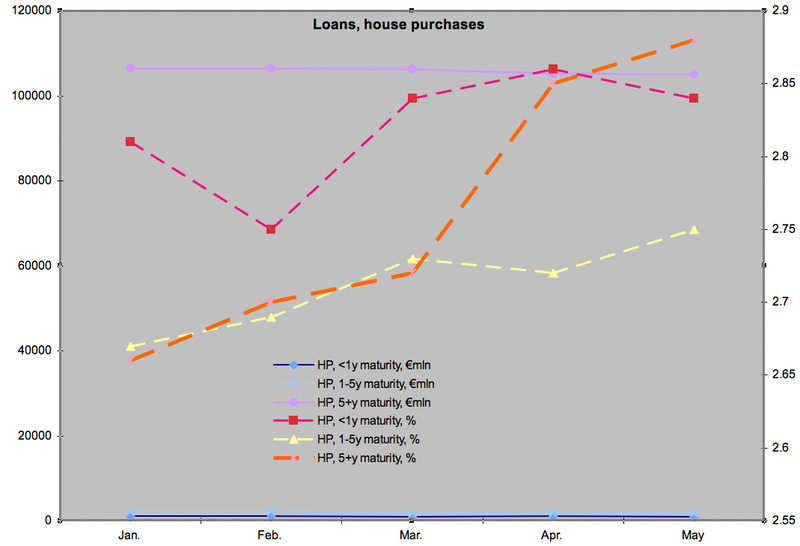 The ECB claw back on longer term lending window did not help this process either. But the stress tests are doing nothing to stop the negative sentiment dynamics. 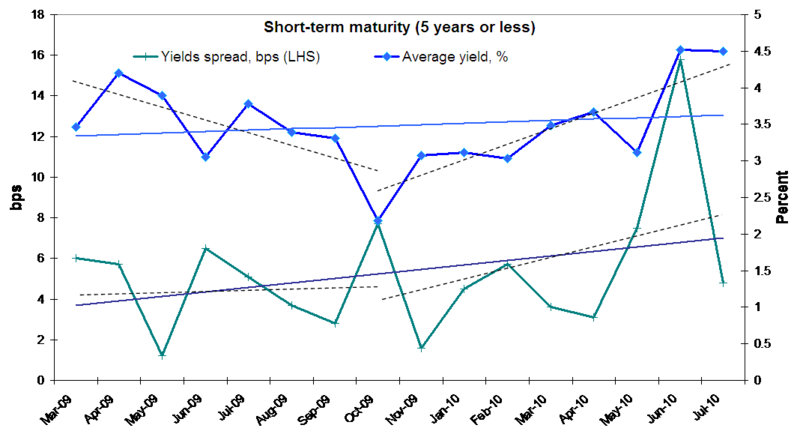 Chart 2 Per chart 2 above, short-term maturities are showing that despite supplying underwriting to about a half of the full year worth of euro area bonds refinancing, the rescue package has achieved no moderation in the short-term risk perceptions of the market. In fact, the rise in euribor is more pronounced in the short term than in longer maturities, suggesting that short term risks of sovereign default remain unaddressed by the rescue package and are exerting a continuous pressure on interbank lending. Introduction of the stress tests also did nothing to reduce overall cost of borrowing amongst the prime banks which were fully expected to pass the test even before the EU got on with setting test parameters. In turn, all of this spells much higher costs of funding for the banks which have shorter term financing needs, such as the Irish banks. The implicit cost of taxpayers’ guarantee for Irish banks debt is therefore rising. And panicked markets are not about to surrender their fears to the EU PR machine. With all the increases in the euribor, the volatility of the interbank lending rates also increased, across all maturities, as shown in charts 3 and 4 below. Chart 3 Chart 4 As evident, in particular, from chart 4, in the longer term, credit markets are absolutely not buying the combination of the EU rescue package, ECB liquidity measures and the stress tests. 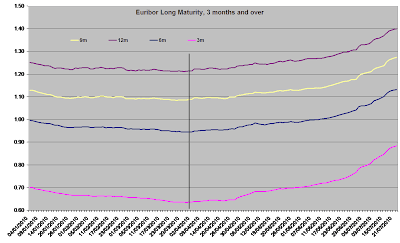 Euribor trajectory for maturities of 6 months and higher firmly re-established and vastly exceeded volatility that preceded the pre-rescue panic. We are now worse off in terms of the cost of banks financing than we were before the Greek crisis blew up. To remind you - Slide 5eurepo is the rate at which one prime bank lends funds in euro to another prime bank if in exchange the former receives from the latter the best collateral in terms of rating and liquidity within the Eurepo basket. 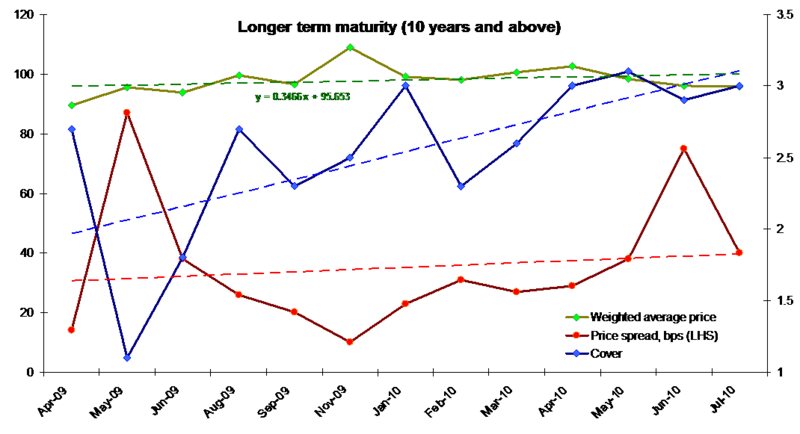 Eurepo rates have posted dramatic increases since mid-June 2010. The original effect of the June 2010 closure of the longer maturity (12 months) ECB discount lending was a temporary reduction in the rates, followed by a stratospheric rise two week later that has been sustained through the end of this week. This is especially true for shorter term maturities, suggesting that part of the adverse effect was due to the heightened uncertainty around the EU stress tests. Chart 5 below illustrates. Chart 5 Chart 6 The u-shaped response in the interbank lending rates to ECB lending changes and to stress tests is even better reflected in the longer maturity eurepo rates, as highlighted in chart 6 above. 3-months and 12-months eurepo rates are now at the levels consistent with the height of the sovereign default crisis. There are significant differences in the rates by maturity group and vis-à-vis euribor due to the fact that the quality of collateral offered in the markets is now itself uncertain as sovereign credit quality continues to deteriorate both in terms of increasing probabilities of default and thus associated risk premia, but also due to the regulatory treatment of collateral that is being signalled by the stress tests. As with euribor, eurepo rates are showing remarkable increases in volatility, for both shorter and longer term maturities. Conduct an absolutely discredited stress test of the banks (designed to provide positive newsflow for the banks, especially for prime banks which should have seen their risk profiles reduced by a mere setting up of the test). In short, none of the measures seem to be working, folks... May be, just may be, the real problem with EU banks is their unwillingness to come clean on loans losses and start honestly repairing their balancesheets? Economics 22/7/10: EU stress tests - what do they tell us, really? The rhetoric from the EU regulators assigning an almost heroic quality to its efforts to test the banks in the face of a clear shambolic nature of the whole exercise. It failed to properly stress test its own banks? In the nutshell: German banks, including Landesbanken, have already privately leaked the ‘news’ that they all had passed the test. Ditto for banks in France, Ireland and Italy. Only one German bank – already failed HRE – has failed the test from among 91 institutions. In the case of AIB – the sick puppy was ‘passed’ by allowing to include into regulators’ calculations the €7.4 billion the bank plans to raise by the end of 2010. Good intentions count for hard evidence, then, per EU regulators. 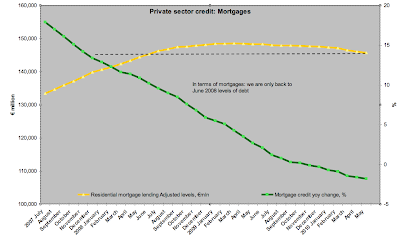 And Bank of Ireland passed - along with all the rest of the PIIGS banks is by the test excluding any possibility of twin shocks - simultaneous continued deterioration in quality of loans and a sovereign debt crisis. 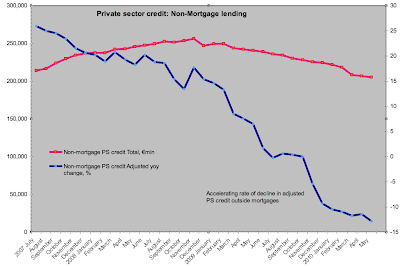 Now, in all likelihood, if the sovereign debt crisis continues to rage, does anyone in their right mind thinks that housing and other asset markets in the likes of Ireland and Spain are going to improve to alleviate the loans book pressures? What the 91 tested banks did ‘pass’ was not a stress test, but a joke, concocted either by those with no understanding of banking (Eurocrats?) or created specifically with an ex ante intent of passing them all. The French and Greek banks privately said that the haircut applied to their holdings of Greek government debt were about 23%. Markets are factoring in 50-70% haircuts, so the EU stress test was less than half as severe as what is being priced already. Worse than that – the sovereign debt haircuts were applied only to bonds held in banks’ trading books. That accounts for just 10% of all Greek bonds held by the euro area banks, as 90% of Greek sovereign debt has been already moved to ‘held to maturity’ parts of banks assets portoflia, not reflected on trading books. And there's more. Per media reports, a memo from Germany's Financial regulator BaFin earlier this year said the real concern should be contagion from "collective difficulties" across the PIIGS, not an isolated default of Greece. All of this did not prevent Irish stockbrokers from issuing upbeat reports about 'the good news' for BofI and AIB. What good news? The shares in two banks rallied today because someone, somewhere, allegedly decided that if Greece softly defaults, Irish banks will survive? Did that someone actually paused for a second to think, before placing a 'buy' order if Irish banks can survive their own home-made disasters? Or whether they can survive a meltdown of Greek debt default as priced by the markets? Or whether they can survive both happening at the same time? Irish analysts, who issue these forecasts should be required to read Taleb's 'Fooled by randomness', though one wonders if they will understand much of what Taleb is saying for years now. Investors who chose to belive that AIB and BofI passing of the 'test' this week is some sort of a 'good news' are simply fooling themselves by ignoring a simple fact of life - misdiagnosing a patient with heart attack as being free of an Avian flu is not going to improving the patient's chances of survival. It actually reduces them. Shamed by this absolutely incompetent, if not outright markets manipulating ‘testing’, you’d think the EU leaders would step back and start an earnest conversation between themselves as to what has gone wrong here. Nope. They are hell bent on creating more Napoleonic sounding, but utterly unrealistic and even disastrously risky plans. This time around – for fiscal harmonization. France and Germany – the two countries that have been clearly at odds with each other in responses to the current crisis have decided that a bout of amicable activism is long overdue. So behold the latest Franco-German alliance on a list of fiscal policy co-ordination proposals. Per reports in today’s media: a French cabinet meeting took place with German presence, during which Sarkozy called for a complete harmonisation of European tax systems. ‘He did whaaat? !’ I hear you cry… yeah, he did call for that which was explicitly denied by him and the entire EU leadership core as ever having a chance of happening in the run up to the Lisbon II referendum in Ireland. Now, don’t take me wrong here – this is not a voluntary call for individual states cooperative action – it is a call for an EU-wide ‘reform’. And if you don’t think so, the same meeting called, once again, for member states with excessive deficits to be punished by withdrawal of voting rights in the Council of Ministers, plus a fine and the compulsory imposition of an interest-bearing deposit for member states. Given grave doubts about EU's capabilities to provide for (a), the automatic default option of any new policies should be to scale opportunism and adopt pragmatic, cautious, incremental reforms approach - when in doubt, measure and caution must be the prevalent guide. After all, if I were a person with the power to shape EU principles, I would adopt the milenia-old medical code of ethics, that is based on the fundamental axiom of morality: Primum non nocere, or First, do no harm. Then again, adopting such a principle would have meant not conducting these 'stress tests'. Economics 22/7/10: Irish bonds auctions - a Pyrrhic victory? That was the swan song from one of Irish stock brokerages. NTMA might have pre-borrowed 90% of this year’s €20bn borrowing target . But two things are coming to mind when one hears this ‘bullish’ statement. Firstly, the €20bn is a target, not the hard requirement. If banks come for more cash, Brian Lenihan will have to get more bonds printed. Secondly, Irish spread over German bunds is now higher than it was at the peak of the crisis in early 2009. 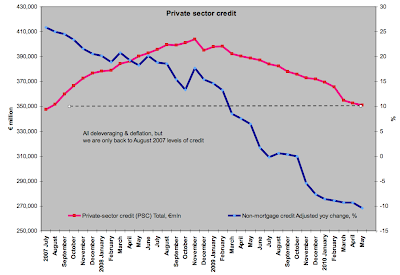 Want see some pictures illustrating Irish borrowing ‘success story’? Chart 1 Average yields are trending up over the entire crisis term and are soudly above their entire crisis trend line since June. More significantly, the trend is now broken. As yields declined in 2009, hitting bottom in October, since then, they have posted a firm reversion up and once again, June and July auctions came at yields above those for this dramatic sub-trend. Worse than that – in complete refutation of ‘improved demand’ claim by the brokers – yield spreads are now elevated. This spread – the difference between highest yield allocated and lowest yield allocated – suggests that markets are having trouble calmly pricing Irish bonds issues. Success or psychosis? Chart 2 below illustrates the same happening in terms of price spreads. Chart 2 Auctions cover for shorter term paper is still below the long term trend line, although the line is positively sloped. Chart 3 Chart 3 above shows just how dramatic was the price decline and yields rise in Q2 2010 and how this is continued to be the case in July. 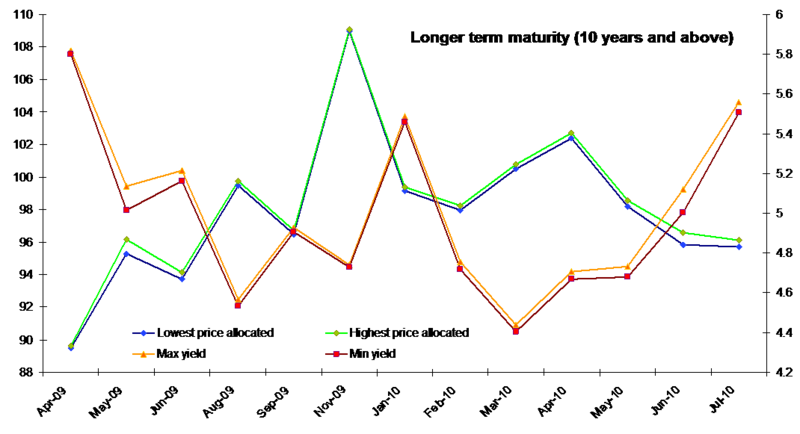 Chart 4 Chart 4 gives a snapshot on pricing. 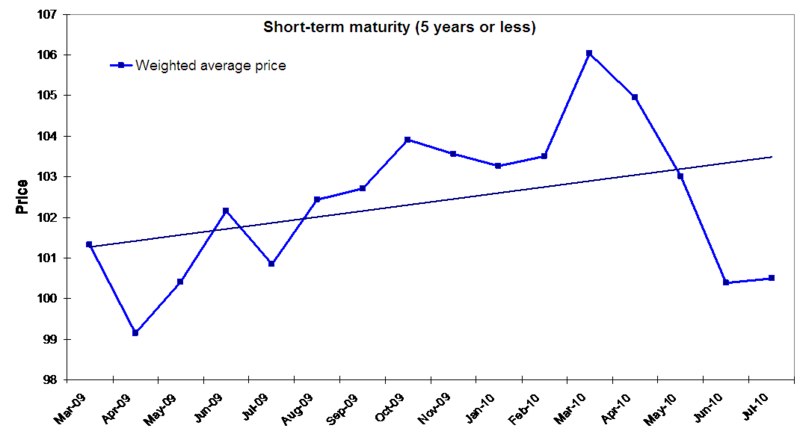 Next, move on to longer term bonds (10 years and over). There has been only one issue of 15 year bonds, so it is clear that the NTMA is simply unwilling to currently issue anything above 10 year horizon because of prohibitive yields. Chart 5 Chart 5 above shows upward trend in yields and July relative underperformance compared to longer term trends. It also shows yield spreads – again posting some pretty impressive volatility in June and bang-on long-term average (or crisis-average) performance in July. If that’s the ‘good news’ I should join a circus. 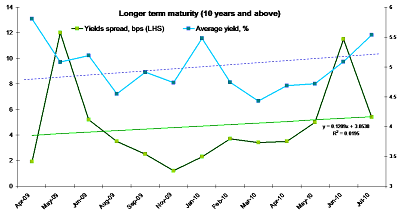 Chart 6 Weighted average price is not changing much over the crisis period, so no improvement is happening here. In fact, since May it is trending down below the long term trend line, suggesting significant and persistent deterioration. Cover is on the up-trending line, but came in below the trend in June and July. Chart 7 below shows more details on max and min prices and yields. Chart 7 Chart 8 Chart 8 above clearly shows how average price is now in the new sub0trend pattern since November 09 price peak. May-July prices achieved are clearly below long term trend line and even more importantly – below the sub-trend line. Chart 9 Notice how before the 2014 deadline, the Exchequer is facing the need to roll over €6,381 million in bonds issued during the 2009-present auctions. If Ireland Inc were to issue more 3-year bonds, that number will rise. That should put some nasty spanners into Irish deficits-reduction machine. But hey, what’s to worry about – our kids will have to roll over some €21,264 million worth of our debts (and rising), assuming the Bearded Ones of Siptu/Ictu & Co don’t get their way into borrowing even more. Table 1 In other words, we are now worse off in terms of the cost of borrowing than in January 2010 – despite the ‘target’ for new issuance remaining the same throughout the period. 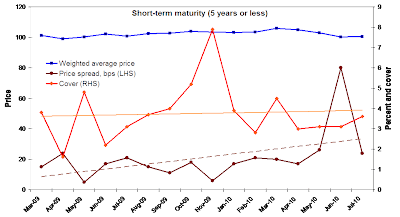 We are even worse off now than at the peak of the crisis in March-April 2009 in short-term borrowing costs, although, courtesy of the German bund performance since then, we are only slightly better off in terms of longer maturity borrowings. The compression in yield term structure delivered in June-July this year is worrisome as well. 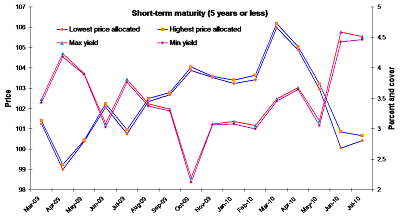 It suggests that the markets are not willing to assume that Irish Government longer term position is that much different from its shorter term prospects. Moody’s has downgraded the long-term ratings for EBS Building Society and Irish Life & Permanent from A2 to A3, stable outlook didn’t help much here. Moody’s also downgraded the government-guaranteed debt of all six guaranteed institutions: AIB, Bank of Ireland, EBS, Anglo, IL&P and Irish Nationwide. Prior to the latest downgrade, AIB and BofI both had stable outlook, and this has been maintained. The reason for the downgrades was the reduction in the government’s ability to support the banks stemming from the sovereign debt downgrade announced Monday. What’s next, you might ask? 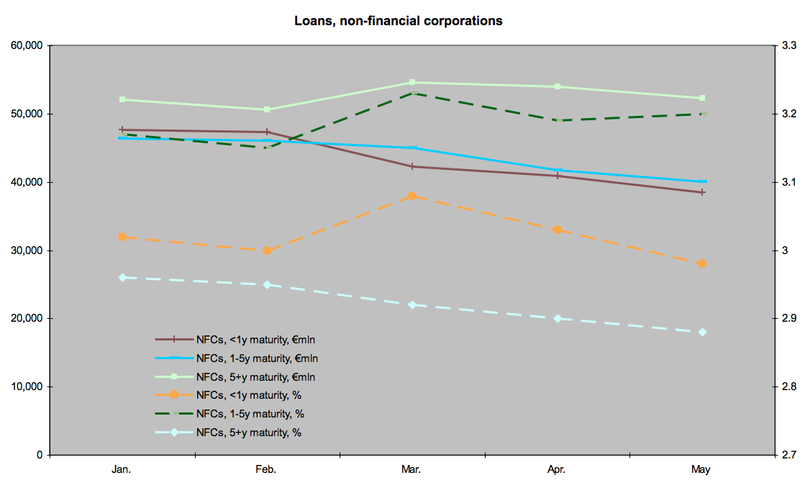 Barring any news on loans impairments etc, the growth prospects for banks will have to be the key. And here, folks, there isn’t any good news. No matter how you can spin the thing. BofI and AIB are disposing of their performing assets – divisions and businesses in the US, UK and elsewhere – in order to plug the vast holes in their balance sheets caused by their non-performing assets. And it’s a fire sale: Polish BZWBK – 70.5%-owned by AIB – is the only growth hopeful in the entire AIB stable. Yesterday, some reports in Poland suggested that PKO Bank Polski, Banco Santander, BNP Paribas and Intesa San Paolo are the only ones remaining in the bidding. Neither one can be expected to pay a serious premium. 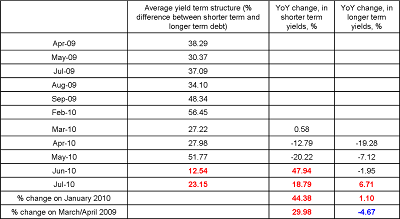 Take a look at M&T in which AIB holds a 22.5%. Not a growth engine, but a solid contributor to the balance sheet. The US bank Q2 profit quadrupled as it is facing the market with structural aversion to banks shares. So M&T is losing value in the market as it is gaining value on AIB’s balance sheet. But hey, let’s sell that, the gurus from Ballsbridge say, and pay off those fantastic development deals we’ve done in Meath and Dundalk. Likewise, BofI are selling tons of proprietary assets, including proprietary wholesale services platforms, which are performing well. Will the money raised go to provide a basis for growth in revenue in 2010-2012? Not really. BofI needs new capital. Not as badly as AIB, but still - €2.9bn capital injection in June is not going to be enough to cover future losses. It is just a temporary stop-gap measure to cover already expected losses plus new regulatory capital floors. Future losses will require future capital. AIB is desperate. €7.4bn is a serious amount of dosh and there are indicators they’ll need more. Of course, in order to properly repair its balance sheet, AIB will need closer to €10bn this side of Christmas (as estimated by Peter Mathews - see here). However, the bank won’t make any noise about that for political reasons. Even after getting no serious opposition to their banks recovery plans for some two years already, the Government is starting to get concerned about continuous and never diminishing demand for capital from our banks. This concern is not motivated by the suddenly acquired desire to be prudent with taxpayers’ cash. Instead it is motivated by the optical impressions Irish banks appetite for Exchequer funding is creating around the world. Sovereign ratings are now directly being impacted by banks weaknesses and some investors are starting to ask uncomfortable questions about viability of AIB outside state control. There’s an added sticky issue of Irish Government deficit potentially reaching 20% of GDP this year should our banks come for more cash. And they will... not in 2010, possibly, but in 2011, once Nama last tranche closes in February (or thereabouts - remember, it has blown through few deadlines already and can strategically move past February 2011 with closing off its purchases, to allow more time for banks to play the 'Head in the Sand' game). If you want to see what is really happening in our sovereign bonds markets, check out the next post on this blog, which will be covering this. Makes you wonder – what kind of test is that if out of 91 not exactly rude-health institutions, only one is expected to fail? At an expected 99% success rate, the EU stress test is clearly designed to put a PR spin on banking sector shares, bonds and interbank credit markets. The only sticky part is that if any of the ‘passed’ banks fail in the near future, the investors should be able to sue the EU for any losses incurred. You see, the EU stress test is designed – at least in theory – to provide important markets-relevant information to investors. If so, someone should be liable for the quality of the test. Had the EU authorities given this a thought? The test is farcical. And you don’t need to see the results to know this much. European banks are set minimum requirement of 6% Tier 1 capital ratio. This is the number being tested. But the US banks had this requirement 2 years ago, and since then have beefed up their capital ratios to well in excess of 9%. UK banks are now in excess of 10%. 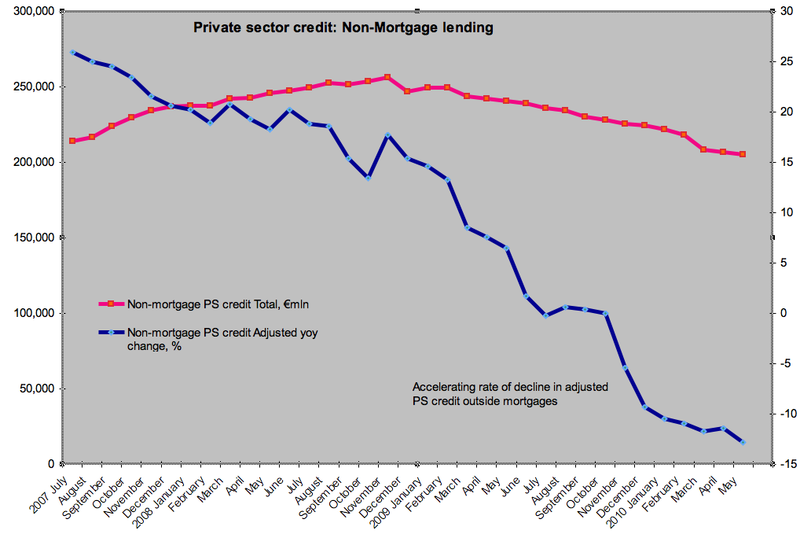 Where does this put the Eurozone with its banking system ‘tested’ to 6%? In a circus terminology – with the clowns, large shoes, red noses and curly wigs in place. So the EU regulators’ decision to put some more powder over their mugs wont be doing much good. FT blogs' Tracy Alloway reported today on what the markets think. The article (linked here) reports that there has been a 50% or more rise in the short positions held against a number of Eurozone banks. Ireland’s sick puppies – BofI and AIB are actually most active on long investors’ lists with long positions up ca 20%. But the two are also amongst the most expensive securities to borrow. In other words, it does seem like shorts are heavily on the side of Ireland Inc’s grand dames. Funny thing, relating to the stress tests, is that a number of public officials – from Greece, to Belgium to Ireland – have already been leaking heavily the ‘news’ that stress tests will clear their banks’ names. One wonders if there is anything else the EU can do to make the whole exercise even more farcical? Economics 20/7/10: Is Zombie Nama propping up Mummified Irish Banks? As the independents – Brian Lucey, Karl Whelan, Peter Mathews and myself – have warned (actively denied by the Government and its backyard ‘experts’), Nama Tranche II turned out to be yet another unmitigated disaster. Nama paid €2.7bn for loans that its experts valued at €5.2bn. Of course, these ‘experts’ include many who were responsible for some of the most disastrous valuations of the Celtic Tiger era and are now ‘entrusted’ as being ‘experienced’ with re-valuing their own errors, while collecting a handsome pay packet courtesy of the Irish taxpayers. The implied average discount these folks put on the loans this time around is 48%. Anglo failed to transfer its loans – some €7-8bn worth – due to delays caused, per what I am hearing, by a rather shoddy documentation quality. Per RTE: “The biggest discount on the second batch of loans was for those from Irish Nationwide. NAMA paid the society just €163m for loans of €591m, a discount of 72% [an increase of 14% on Tranche 1]. The figures for AIB and EBS were 48.5% [on €2.73bn marking a 6.5% increase on Tranche 1], and 46.5% [on €35.9mln and an increase of 9% on Tranche 1] respectively, while the Bank of Ireland discount was 37.8% [on €1.82bn - an increase of 2.8% on T1].” Overall, Nama now has in its vaults €20.5bn worth of loans (or rather largely worthless paper few years ago labeled as loans) for which it paid at a discount of 50.7%. The loans are concentrated - related to just 23 property developers who are deemed to be 'second tier' aka less flamboyant than those in Tranche 1 and most likely, less experienced too. It makes me laugh when I recall how our stock brokerage 'analysts' were chirping a year ago that a 20-25% haircut would be warranted by market valuations of these loans. However, the real problem with all of these numbers is that while the discounts might sound impressive, they are not reflective of any reality. Instead, they are now fully bootstrapped to the capital commitments issued to the banks by Brian Lenihan. You see, as we warned from the start – and this too was vigorously denied by the Government – the heavier the haircut, the greater will be banks’ demand for capital, the greater will be the share of bank equity owned by the taxpayers. Mindful not to take too much stake in BofI – for that would produce poor optics internationally – Brian Lenihan is content to oversee a 38% discount on its loans. Having pumped capital up to 50% of risk-weighted assets transfers to Nama for AIB, the Minister is equally happy not to impose heavier haircuts on AIB Tranche 2 transfers than 50%. Hence the ‘magic’ 48.5% figure. Ditto for EBS. Sounds precise – not 49%, nor 48%. But in the end – the number is most likely utterly bogus. To put some fluff in the air about ‘Nama is a tough player with the banks’, Tranche 2 hammered INBS and most likely will hammer Anglo. Unless, that is, Anglo fatigue has finally reached Upper Merrion Street buildings. In this case, a discount can be less than that for INBS. Not because Anglo loans have miraculously become sterling in quality, but because the DofF might be just slightly concerned that the bank will come with a fresh capital demand. So instead of pricing the loans to market, Nama now appears to be pricing them to keep required post-Nama recapitalizations at the levels consistent with earlier Government capital commitments. In the end, however, a 48% average discount is still a gross overpayment on these loans. Let’s do a back of the envelope calculation here. 12.5% of Nama loans are losing net 8% pa.
Expected average annual loss on Nama overall portfolio is therefore 11.25% pa. Value this at x3 revenue flow. Nama portoflia of loans would have a negative, yes, negative, - 34% break-even valuation in the market. Just on the back of interest and costs alone, the value of Nama purchased portfolio of loans should be no more than 66 cents on the euro of face value. Next, subtract the percentage of loans that are unsecured – while allowing for the expected recovery, subject to the risk. Suppose that 20% of loans taken on by Nama are unsecured (again, likely to be conservative assumption). Suppose these are distributed across the same 12.5%, 12.5% and 75% sub-portoflia following a uniform distribution (again, this is a generous assumption as lower quality loans are more likely to be less secured in the real world). The value of the entire package of loans is now worth only 59 cents on the euro. Secured loans are also subject to a recovery risk. In general, risk of recovery implies that over 70% for loans in arrears will be non-recoverable, ca 50% for loans under stress (e.g. 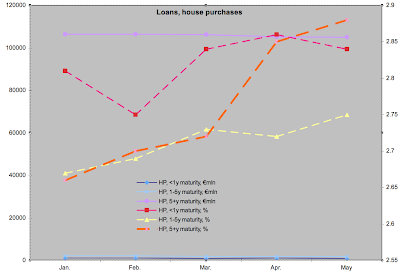 failing to pay principal when it is due) and 20-25% for loans that are fully performing (e.g. those that are repaying principal and interest to the full amount). These are numbers consistent with the 1990s experiences in Sweden and UK. Translating these into our valuation, adjusted for risk of recovery implies the value of Nama-bound loans around 30-32 cents on the euro. Other risks can be priced as well, but let us stop here. Even with relatively rosy assumptions, the value of the loans being purchased by Nama should be at maximum 32 cents on the euro. Allowing for assets appreciation of 10% over 3 years would imply a valuation of no more than 37 cents on the euro without applying a PDV adjustment. We are told that Nama is being a tough buyer, paying 52 cents on the euro. Who’s fooling who here? Incidentally, 30 cents on the euro is what independent banking expert Peter Mathews has estimated as recoverable for all development and property loans held by the banks. It is also the number that myself and Brian Lucey have arrived at in our previous estimates of required haircuts, which were based on analysis of underlying property markets. What is now clear is that 24 months since the crisis fully exploded in our faces and 15 months after the independent analysts started telling the Government that it is committing a grave error in pushing forward the solution that, under the original name TARP was rejected in the US two weeks after it was put in place, the Irish Government remains hell-bent on pursuing this wrong approach to banks recovery. More egregiously, with Tranche II loans in, there is a strong enough reason to suspect that Nama has turned into nothing more than a façade for delaying even more capital demands from the banks until the end of 2010. The reason for this, one might speculate, is to keep our 2010 public deficit from exploding to beyond 20% of GDP. A zombie institution (Nama) now is fully in charge of our mummified banking system. What can they do next to make things even more dynamic than that? As Brian Cowen has been telling the world that Ireland has turned the corner, the country got some rude awakening. First, Moody’s – aka the lagging indicator – pushed Irish bond ratings one notch down to aa2. Second - and I will be covering this in a separate blog post - Nama has completed transfer of the second tranche of loans. With it, Moody’s also downgraded to aa2 that ‘not our problem, says Lenihan’ debt called Nama bonds. Irony has it, for all the SPV accounting tricks deployed by the Government, Nama bonds are rated on par with sovereign bonds and Moody’s statement justified both downgrades as being primarily driven by “the government’s gradual but significant loss of financial strength, as reflected by its deteriorating debt affordability”. Oh, mighty. So Moody’s believes that Nama will generate final losses. May be not as bad as €41bn (1/4 of GDP), but certainly losses. And notice that losses below 25% of GDP are expected by Moody’s explicitly in the scenarios that are better than or equivalent to their ‘moderately stressed scenario’… Of course, Nama’s Business Plan Redux envisions losses only in the ‘worst case scenario’ and even then, the modest €800mln. Bank recapitalizations that Moody’s have factored in – at €25bn to date – have already been exceeded, with current running estimate at €32bn committed, plus last week’s open-ended offer to give AIB anything it needs from Brian Cowen. These are likely to rise once again after today’s announcement from Nama on tranche II transfers. So condition (ii) is already satisfied. Per economy’s likelihood of a rebound – well, give it a thought. 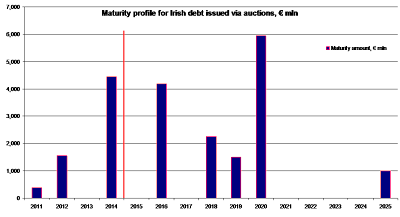 Government policy over the last two years was characterized by increased taxes, retained waste, lack of reforms in public sector, lack of reforms in state-controlled private economy, lack of reforms in bankruptcy laws, massive waste of funds on poorly structured banks supports, and laissez fare in relation to banks and semi-state companies ripping off consumers and businesses. None of it is likely to change in 2011-2012. Which part of this litany of economic policies misfires can contribute to an increasing likelihood of a robust economic rebound? Ireland is clearly not out of the woods when it comes to bonds ratings and this persistent problem of continued deterioration of public debt ratings will be a costly one. Mark my words – as Ireland’s public finances continue to deteriorate, our debt will become more costly to finance. Should the Government opt for any tax increases in order to raise 2011 revenue, it will face continued fall off in income and transactions taxes collected, as people engage more actively in tax liability minimization. This will trigger widening of our deficits in excess of international forecasts (no one pays attention to our own ‘rosy’ forecasts anymore), leading to further debt downgrades. In particular, I would expect Fitch to move first once again to put two notches between itself, Moody’s and S&P. One more point before we conclude. 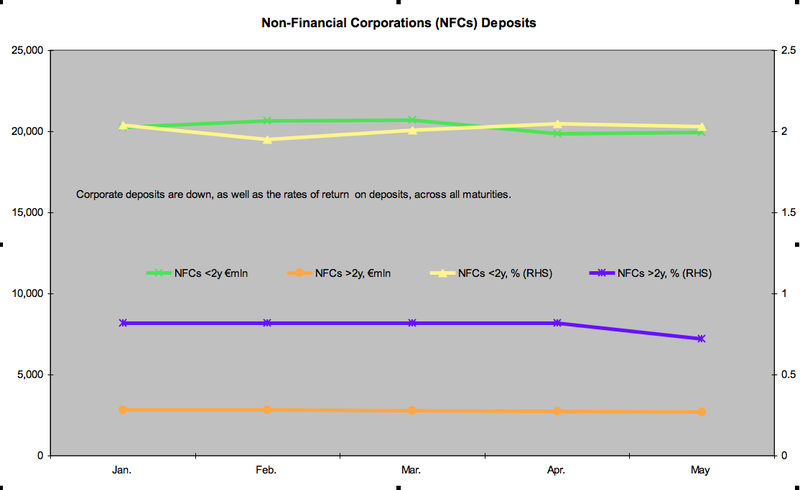 Irish banks are heavily dependent for capital and collateral on Irish sovereign and Nama bonds. The latest downgrade must have an adverse longer term impact on the quality of the banks balance sheets. Regardless whether AIB and BofI pass their EU-administered stress tests or not, I would expect the Moody's downgrade to have potentially significant adverse effect on Irish banks ability to tap private markets for funding in the near future. This, of course, might trigger another run on the Exchequer and customers by our leading banks. Lagged levels of education are a better determinant of income per capita than contemporaneous levels of education, which suggests that causality flows from education to growth, rather than the other way around. More educated workforce is negatively correlated with the importance of high tech manufacturing in the economy. 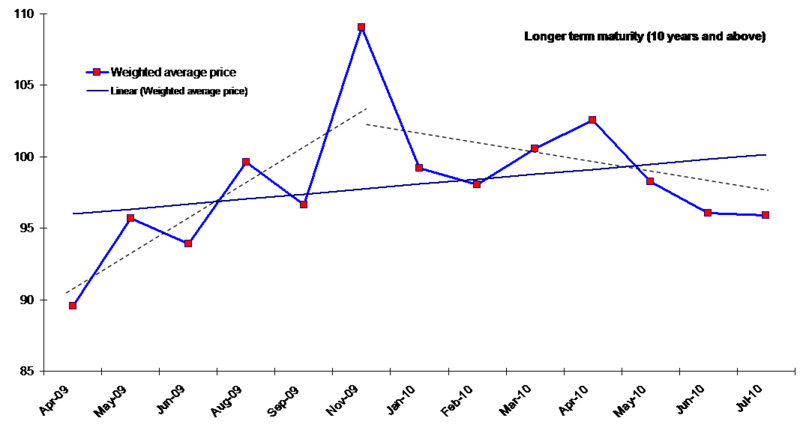 This correlation is becoming more negative over time (with lags). The relationship between education levels of the workforce and the importance of the knowledge intensive services role in the economy is positive. This positive correlation is not increasing over time. Overall, knowledge economy – as far as it is captured by third level education – is positively linked to services, and negatively linked to high-tech manufacturing. The negative correlation between the degree of workforce education and the extent of the high-tech manufacturing (HTM) in overall economy had become even more negative between 1999 and 2007. The positive relationship between the degree of workforce education and knowledge intensive sectors (KIS) has become weaker over 1999-2007 period. Greater importance of high-tech manufacturing in the economy is associated with lower GDP per capita, and this negative relationship is strengthening over time, both in the explanatory power and in the size of overall negative effect. Regions that started (back in 1999) with greater share of HTM in overall economy tended to have lower GDP per capita 9 years later. Knowledge Intensive Services are strongly positively correlated with GDP per capita. 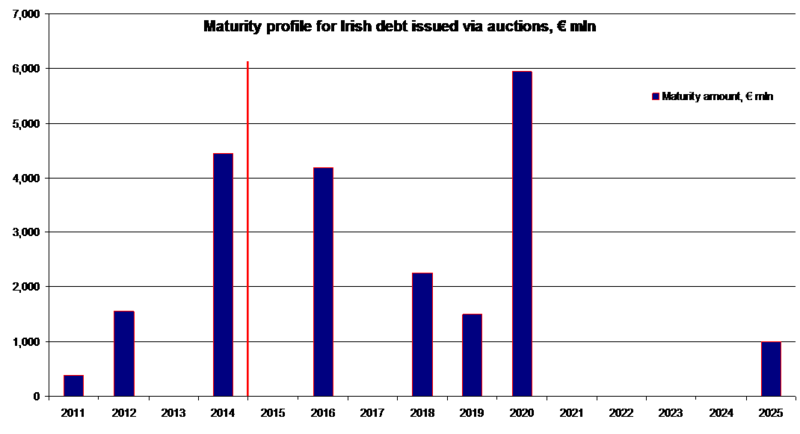 This relationship is true for contemporaneous correlations and for the lagged one. 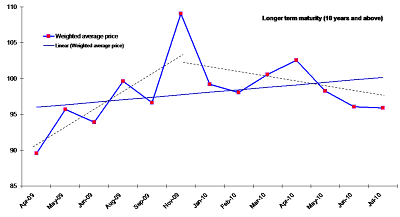 The positive correlation between income and KIS is increasing in strength (slopes) over time, as well as in statistical significance.